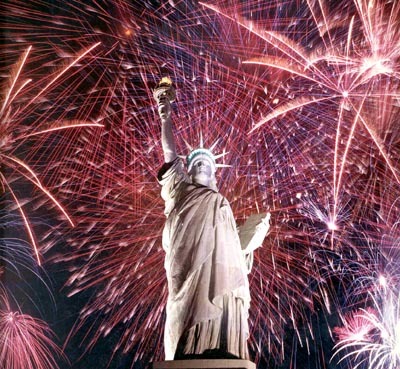 El Monte RV wishes you a Happy Fourth of July! 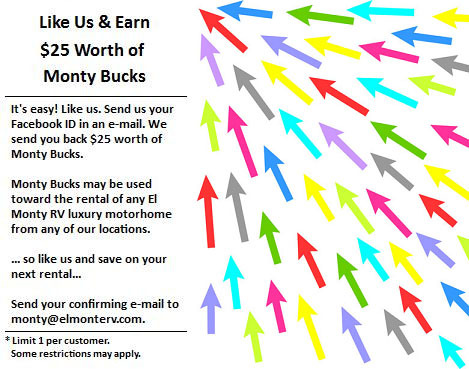 El Monte RV makes it easy to hit the road this Fourth of July. 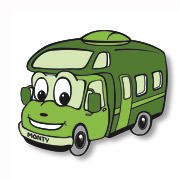 With a wide variety of vehicles beginning with the economical 22 Class C to the luxurious diesel pusher, we're sure to have a motorhome that meets your needs. Take a trip to one of your favorite camping destinations. 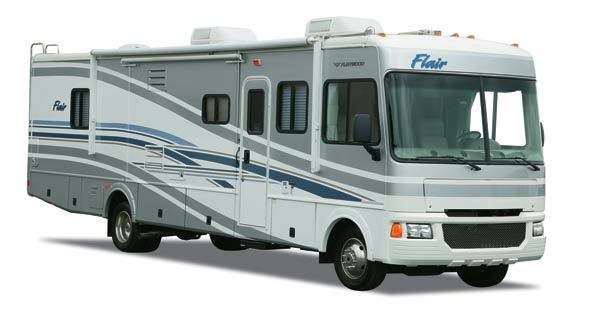 Whether the road takes you to the mountains for some trout fishing or to the beach to take in some body surfing and spectacular sunsets, you'll travel in comfort in an RV. But don't wait... the holiday is almost upon us and availability is going fast! We make celebrating the 4th easy, convenient and fun with nationwide locations. The Coke Zero 400 race at the Daytona Int'l Speedway on July 5! The Camping World RV Sales 301 race at the New Hampshire Motor Speedway on July 13! The Brickyard 400 race at the Indianapolis Motor Speedway on July 25 - 27! Our featured Campground of the month is the Hershey RV & Camping Resort in Lebanon, PA! Set on 200 acres of rolling farmland in the heart of Pennsylvania Dutch Country, Hershey RV Camping preserve is enclosed in a natural valley of grassy fields, sloping down to a small fishing lake. Six miles away is Hershey's Chocolate World (rides and live entertainment), ZooAmerica, plus many golf courses and 3 major outlet centers. Nearby their Thousand Trails Pennsylvania Dutch Country RV campground are also Amish settlements and the Indian Echo Caverns. 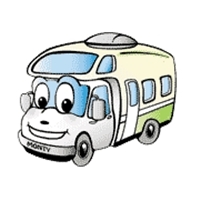 Hershey RV Camping has something for everyone, from the amusement park enthusiast to the history buff! Amenities include hiking trails, fishing, swimming pool, volleyball, shuffleboard, mini-golf, horseshoes, playground, whirlpool/spa/hot tub, store, laundry facilities and more! With the upcoming Fourth of July holiday, it's the perfect time to visit the birthplace of the Father of our Nation. Although the original home that George Washington was born in was destroyed in a fire in 1779, the monument is a testament to the landscapes and regional influences that shaped him as a man and later, as leader of our fledgling nation. It was the landscape that led George's great-grandfather John Washington to settle at this location in 1657, after immigrating in 1656. Five generations of Washingtons are buried here in the Washington Family Cemetery. The visitor's center offers exhibits, films and a bookstore. You'll want to visit the Washington Family Burial Ground, as well as the Living Colonial Farm. Ranger talks are given every hour during the day as well. 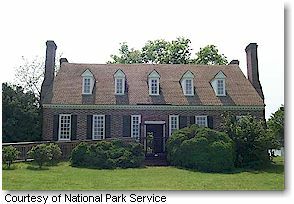 Other sites of similar interest are George Washington's boyhood home at Ferry Farm, or Mount Vernon, where he lived for more than 40 years. We have an RV rental location in the Baltimore, MD area that makes the drive to this national monument easy. However, if starting your trip from another location is more convenient, we also have many other rental offices, so please visit our locations map to find a location that may be more suitable. ~ Preheat oven to 450 degrees. ~ In a large skillet over medium high heat, cook bacon until crisp. ~ Remove bacon to paper towels to drain. ~ If necessary, fit thawed pie crust into pie pan, crimping edges. ~ Crumble bacon and sprinkle into unbaked pie crust. ~ Sprinkle shredded Swiss cheese and shrimp over bacon. ~ Shred crabmeat with a fork and arrange crabmeat over cheese and shrimp. ~ In a medium bowl, whisk together eggs, half 'n half, salt, sugar, nutmeg, cayenne pepper and pepper and mix well. ~ Carefully pour egg mixture over ingredients in pie crust. ~ Clean and slice shiitake mushrooms. ~ Arrange mushrooms over the egg mixture in the crust. ~ Bake in oven for 10 minutes. ~ Reduce oven temperature to 350 degrees and bake for an additional 25 to 30 minutes, or until set and eggs are no longer runny. ~ Remove quiche from oven and let stand for 10 minutes before slicing into wedges. This best selling Class A slide-out model with bunk beds sleeps six, comes with 2 slide outs, stove, refrigerator/freezer, microwave, generator and so much more. Looks like new! Includes warranty.